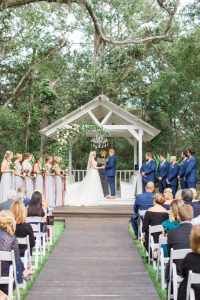 Living in Orlando is a perpetual delight for Alaina and Ryan who work in the region known as the “happiest place on earth.” However, for their wedding, they desired a venue that was just as magical as where they lived—yet rustically romantic. They found their dream venue at Chandler Oaks Barn in St Augustine, Florida. This unique venue in the heart of Florida is a working farm–and is an enchanting journey from Orlando. Guests were greeted by a 1950’s pickup truck with a sign directing them to the winding dirt road that led to the ceremony site. Outside of a large white barn was an antique “donut” food truck and vintage “Country Store.” Inside the barn were chandeliers and double doors leading outside to a gazebo adorned with glorious flowers —surrounded by an enchanting forest and native wildlife. Rev Joy Blessing of Sensational Ceremonies, composed a contemporary ceremony that was a celebration of love and joy–and included elements reflecting the unique and beautiful qualities of the Bride and Groom. They chose to include in their ceremony the beginning of a tradition for them–and “Anniversary Beer Box” They provided a bottle of their favorite beer to put into a keepsake box along with intimate love letters to each other–and a copy of the custom ceremony by Rev Joy Blessing. On every anniversary, they will open the box, drink the beer, read their letters to one another and the words from their wedding ceremony—and then, write new letters reflecting their thoughts about each year they are together. Family and friends traveled from far away places to join them on their best day ever–such as from California and Hawaii—and all agreed it was well worth the time and effort to be there—to witness the magic, the mystery–the incomparable joys of this moment in time for Alaina and Ryan like no other before in their relationship –or would ever be again. Rev Joy Blessing had asked Ryan and Alaina to write whto her what they loved most about each other as they anticipated their wedding day. RYAN’S WORDS: “When I think about all the amazing qualities that made me fall in love with Alaina I tend to get overwhelmed with all of the greatness she exudes. I can’t go a few minutes without her crossing my mind, let alone hours or days. The way she smiles when something familiar or silly crosses her mind. The way she can take control of any situation. The way she takes care of all the people in her life. The way she focuses on solutions and doesn’t dwell on problems, she’s an inspiration to me and a natural leader, who I am lucky enough to call my partner. I could not accomplish the things I do without her by my side, and I need her there to continue my own journey. I am only so strong and can only do so much on my own and will always lean on her for help and support. She fills in all the missing pieces in my life and I am always happiest when I’m with her. Oh goodness I could probably write you a novel about why I am so in love with Ryan, how amazing he is, and how lucky I am to keep him as mine forever. When we are together I always feel a sense of peace and happiness. He makes me calm without even trying and uplifts my mood just by being present. He loves me and life so effortlessly. I know we are soulmates because he filled that missing piece of me I never knew I was looking for. He is my biggest support and motivator to be my best self and strive for what I want no matter how crazy the idea may be. I never knew I was waiting for someone to complete me, but now I can’t even possibly imagine my life without him. We laugh more than I have ever laughed and smile more than I ever thought possible. He makes my heart do flips and makes me feel like I’m the most special person on this earth. I want to explore the world with him, start a family, and do everything together. He truly makes my world complete and I could not be more excited to continue on this crazy journey with him by my side. And….for Ryan and Alaina…..the best is yet to come! !